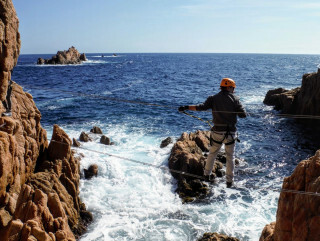 Navigate a via ferrata over the magical rocks of Costa Brava. 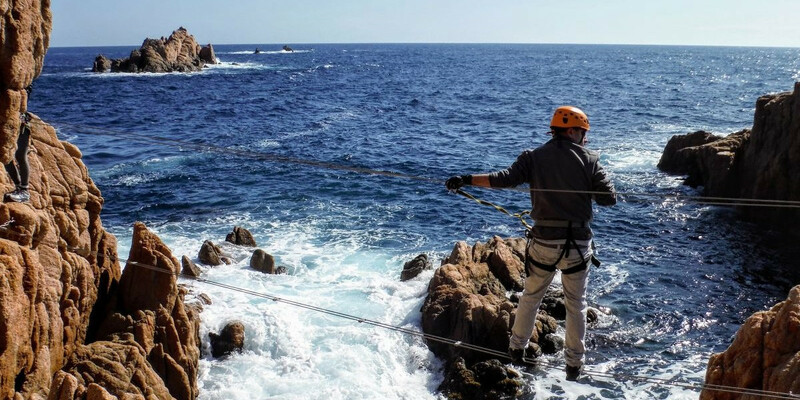 Climb steep walls, cross wooden planks, and traverse rope bridges above the sea. We only run private tours for 1-8 people. 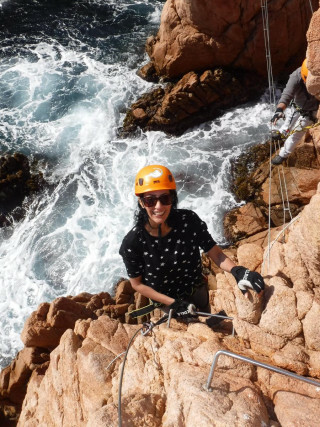 Even though this via ferrata is accessible for beginners, we can only guide clients with at least average physical abilities and who are confident on uneven terrain. 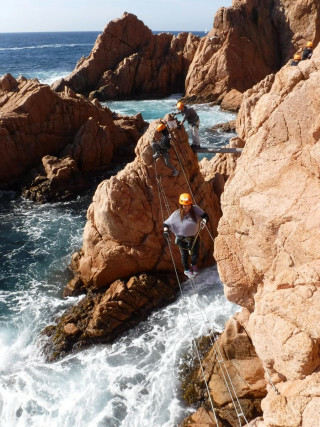 The route is suitable for children 10+ or 8+ if confident. The start time is 9:00 a.m.
What to bring? Comfortable, stable sports shoes (not flip-flops), some sun protection, and your swimsuits in case you would like to go for a dip after we climb. 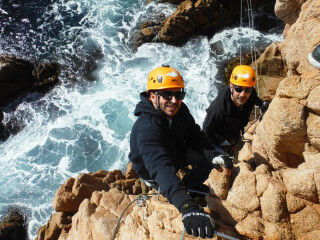 Gloves for the via ferrata are not necessary, but we can lend them if you prefer. Your booking will become valid after we receive your payment and send you a confirmation voucher. You can cancel up to two days in advance with 100% reimbursement. For later cancelations there is no compensation. Northern Spain hosts many via ferratas, but the most beautiful course lies in Costa Brava. 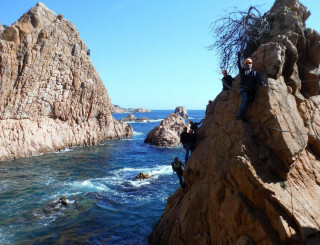 On this one-day trip, you traverse through the heart of a protected coastline full of rocky terrain and roaring waves. At 9:00 a.m. our guide picks you up at your accommodation in a comfortable van. After driving just over in an hour across Spanish countryside, we arrive at Costa Brava where you receive the necessary equipment and simple instructions. 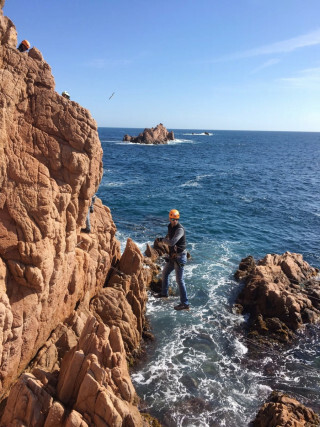 During the climb, an experienced guide accompanies you to ensure your safety and to help in case any difficulties arise. You also receive plenty of information about the unique cultural and natural area as you ascent. 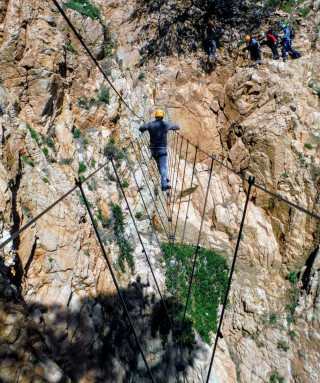 On the via ferrata you climb rock walls and cross Tibetan bridges, steel cables, and wooden planks. Occasionally you hop from one rocky island to another. 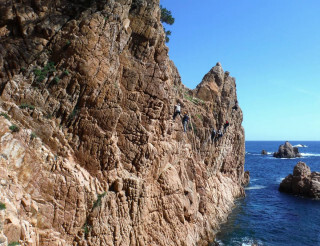 The entire journey travels along Costa Brava’s typical orange rocks, a striking contrast to the turquoise waters below. 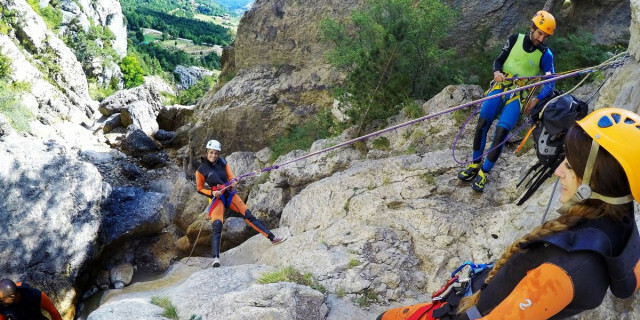 To cross the whole via ferrata takes about 3.5 hours. When we finish, we enjoy 2-3 hours of relaxation and swimming. You can opt to eat on the scenic beach or in a local restaurant. 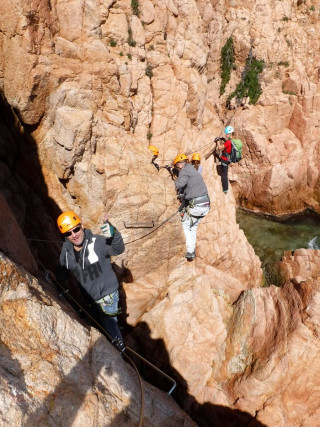 Afterward, we head back to Barcelona, arriving around 6:30 p.m.
Because the entire via ferrata is intermediate level, the trip is accessible to beginners with no previous experience. It’s always challenging, always fun, but never too hard or technical. This trip can be done all year round, with varying experiences due to the ever-changing mood of the sea. 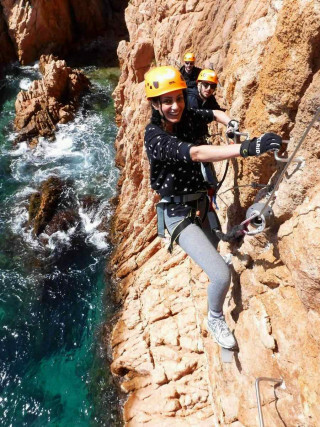 But no matter the time of the year, the terrific blend of sun, sea, and nature of the unique seaside of Costa Brava make this a holiday memory full of adventure. A thrilling day full of climbing and gliding through canyons, streams, and waterfalls. This is mountain adventure at its best.